Last week, attention should have been focused on Sinn Fein's wrecking of the Executive, the SDLP's and DUP's concern about the astonishing and suspicious rise in proxy votes in six nationalist/republican areas, the mysterious large donation made to DUP at the time of the Brexit referendum, and various other grown-up issues. Instead with what turned into 'Blondegate', with the unwitting help of the Sunday Independent Sinn Fein has had another hit in its long-running 'Winding-up- the-Prods' strategy. It began last Sunday with a friendly interview Niamh Horan did with DUP leader Arlene Foster. Because they like to paint unionists as dinosaurs and bigots, it was annoying for Sinn Fein when the DUPers chose a woman as leader who - unlike her two predecessors - had an irreproachable background. They want to destroy her. The Reverend Ian Paisley was for decades a hate-mongering rabble-rouser, and Peter Robinson had been close to loyalist paramilitaries during the 1980s, but Foster's only association with paramilitaries was as a victim of the IRA. She eloquently described to Horan her memories of the night her father - a farmer and part-time police reservist - was badly injured by Seamus McElwaine, a legendary assassin from Monaghan, and the family had to flee their farm, and then, as a teenager, her own narrow escape from death when her school bus was blown up. When asked by Horan if she had forgiven McElwaine and Martin McGuinness, who gave a eulogy at his funeral, she pointed out that neither McGuinness nor the republican movement in general ever asked for forgiveness. Most Ulster Protestants freely forgive sinners who repent, but since the Provisionals refuse to admit they did anything wrong in murdering almost 2,000 people and injuring tens of thousands, and therefore neither repent nor ask for forgiveness, it isn't forthcoming from the likes of Foster. What bewilders and hurts Ulster unionists - who lived stoically through 30 years of terrorism - is that although they were on the side of law and order and few gave any support to loyalist paramilitaries, the Provisionals' genius for propaganda and their consistent demonisation of anyone who opposed them, has painted those who defended the state against terrorism as the bad people. So that's the backdrop to Arlene Foster. More recently, there were the scars of 'Crocodilegate'. 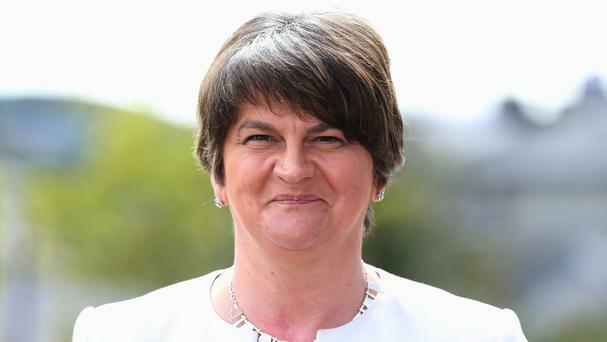 Launching the DUP's election campaign last February, she rejected Sinn Fein demands for an expensive Irish Language Act on the grounds that the language has had £171m spent on it in recent years and that: "If you feed a crocodile it will keep coming back for more." So Foster was being careful about what she said, but she was trying to be open rather than parrot slogans, so when Horan asked her to play a word association game she agreed. She avoided being offensive about people who routinely publicly praise the gunmen and bombers who murdered her neighbours, friends and colleagues while criticising unionists for not reaching out to them. The worst thing she said about Gerry Adams was that he "has a very strange personality" and Mary Lou McDonald, whom she doesn't "really know", she found "quite standoffish. More so than Michelle O'Neill". Coaxed by Horan to say more about Martin McGuinness's successor as party leader, she said: "I don't want to be sexist...."
Horan was in Mrs Doyle mode: "Ah, go on," she said, "it's not sexist if it's true."' So Foster said O'Neill was "very attractive", well-presented and always with her make-up and hair "perfect", then rather wistfully spoke of her own "bad hair" days. In Arlene Foster's slightly old-fashioned world, these were genuine compliments. She has had her own self-esteem badly undermined by the vicious republican trolls who savage her looks on social media. She didn't quote them, and there are few printable examples. As she had told Horan, some of the remarks had made her 17-year-old daughter cry. "'Is she really a man?'... [is] pretty hard to take when you are the daughter of that person." Sinn Fein immediately put out a press release which didn't include what she'd actually said, but quoted Elisha McCallion MLA saying: "The sexist and disparaging remarks made by Arlene Foster in relation to Michelle O'Neill are nothing short of disgraceful" and "highlights the DUP's lack of acceptance of the principles of equality, integrity and respect". In a letter to The Irish Times complaining about an editorial critical of Sinn Fein, O'Neill said: "It is wrong to portray DUP behaviour in the election campaign as 'conciliatory' just a day after its leader Arlene Foster made sexist and personalised and disparaging remarks about me as her political opponent." Reflecting in her interview on the bitterness that violence caused, Foster said: "That's what paramilitarisation does to people... it's part of their raison d'etre - to divide." Unfortunately, the raison d'etre of the republican movement in peacetime is proving to be exactly the same.